Albert Einstein and … Lady Gaga? Today, National Geographic Channel released a new first look at their upcoming TV series Genius. From Brian Grazer and Ron Howard, the drama chronicles the life of the famous physicist Albert Einstein (Geoffrey Rush). The cast also includes Emily Watson and Johnny Flynn. Premiering in the U.S. on Tuesday, April 25 (and around the world in 171 countries and 45 languages), GENIUS charts how Albert Einstein, an imaginative, rebellious patent clerk who struggled to land an academic post in his early years, went on to become the greatest scientific mind of the 20th century, all while juggling volatile, passionate and complex personal relationships. Ron Howard makes his prime-time television drama directorial debut with the series premiere episode airing April 25. The commercial featuring Rush as Einstein, shot in Prague earlier this week, was created for National Geographic by ad agency McCann New York. The ad opens with Einstein in his study, picking up a violin, tapping into his well-known passion for playing Bach and Mozart. Einstein plays the song with tremendous passion and emotion, exactly the way we imagine he would – while at the same time reflecting a sense of his tumultuous love life. The violin sings out harmoniously; there are moving rapid flashes of handwritten scientific equations symbolizing his rebellious, no-holds-barred approach to science. 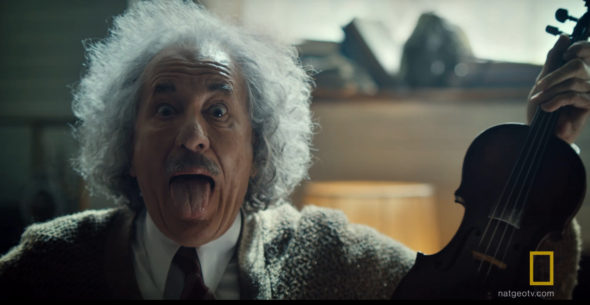 Einstein then abruptly stops, and as he sticks out his tongue – Einstein’s signature gesture – and we reveal the series premiere date of Tuesday, April 25. The spot was conceived by McCann New York and directed by acclaimed commercial director Ivan Zachari�. What do you think? Are you interested in Einstein? Will you watch Genius? More about: Genius, Genius: canceled or renewed?, National Geographic Channel TV shows: canceled or renewed?